ProGaslicht, our Club for the conservation of gas-lighting, introduces itself. We are glad to see that you show interest in gas-lighting, gas-lighting techniques, gas-lanterns and gas-lamps. Our club was incorporated on March 1st 2009 in Berlin-Blankenfelde. Until this date, we were an informal group of gas -lighting enthusiasts and collectors who tried by any means to conserve extant gas-lights which were several tens of thousands in Berlin. We were simply a civic initiative until then. Unfortunately, politicians, city-management and the lobby of the electro-industry keep trying to abolish gas-lighting in Berlin. industrial change, but especially the changes in cities by war damage and urban transformations have led to the almost total extinct of gas lamps. Few cities still retain many of their gaslights, mostly on individual confined quarters. Indoors, gaslight plays virtually no role any more. The still existing gas lamps are a godsend to our time, because they allow us to experience a lighting-culture that is totally unknown to a large public. Gas lanterns and gas lamps are everyday-culture to enjoy within touching range for everyone. Let yourself be enchanted by gaslight. Our website invites you to discover the charming gaslight with the various facets. We introduce gas lanterns and explain to the visitor how they work, as well as show gas-lit places. You'll also find here news about gas lighting and the fight for their preservation throughout Germany, Europe and the rest of the World. You can also get from us information about the relationships between gas-lighting and other cultural and artistic aspects of life. Our current monthly newsletter, "Der Zündfunke" (the spark) is available for free as a PDF-file. We are grateful for all forms of assistance, whether in the form of a membership, a donation, a letter or e-mail, contributions to the website or our newsletter or for interesting notes on gas lanterns and gas lamps. 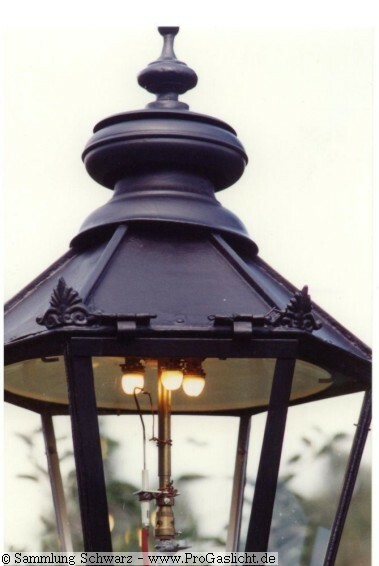 If you wish to install a street lamp in your home, garden or other premises, we can support you with help and advice.